At this Wednesday's meeting, we had 19 members present as well as 1 guest, Liliana Marlene Esparza, a guest of Alfredo. Tina is doing the Rotary Moment this month. She will be talking about Rotarians she has met that have had an impact in her life. She told us about meeting Jim Sparling, a RC Saanich member who is a specialist in chest / respiratory medicine and ran the VIHA chest clinic for more than 10 years before retiring in 2010. Jim has been volunteering in Uganda since 1994 on his own and in partnership with a number of Rotary Grants - created the Friends of Mengo Hospital Society. His focus is Tuberculosis. Current incidence in Canada for TB is ~5/100,000. In the 1700’s/1800’s in Europe when TB was at its worst, the incidence rate was ~35 – 40/100,000. In 1994 at a Montreal medical conference professionals were speculating the end of TB in the world by the turn of the century. Currently, in Uganda, the incidence rate is ~700/100,000 and in sub-Saharan Africa it climbs to 1000-2000/100,000 depending on the country. The game changer has been HIV. It suppresses the part of the immune system designed to resist TB. 3 of our members attended the Rotaract meeting at King George school. They were very impressed by the number of attendees and how enthusiastic and comitted they are! 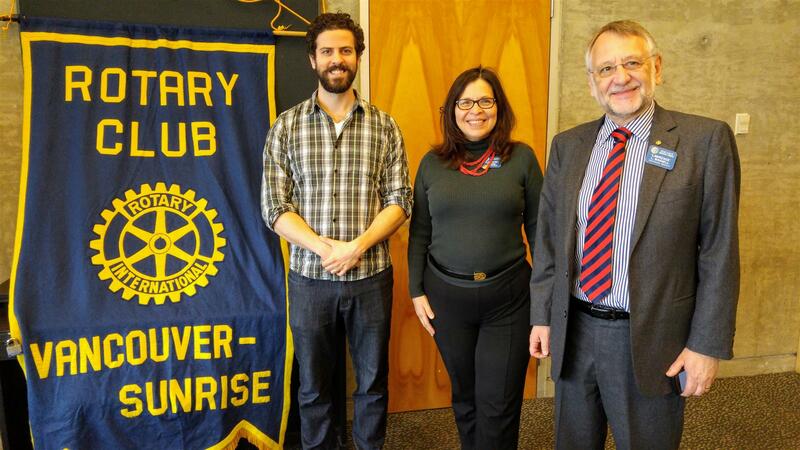 Meeting - Today our guest speaker was Daniel Rotman. Daniel has a background in all things mind related and an interest in all things sustainable. He studied Cognitive Science and went on to complete a Masters in Conflict Resolution. The conflict he sees as the most pressing today is with our relationship to waste. He currently volunteers with SPEC as Co-Chair of the Zero Waste Committee where he is developing a waste reduction education program. He spoke about the "circular economy". A circular economy is an alternative to a traditional linear economy (make, use, dispose) in which we keep resources in use for as long as possible, extract the maximum value from them whilst in use, then recover and regenerate products and materials at the end of each service life. Below are links to the resources I showed during the presentation as well as additional links to resources and other areas of interest.